1. 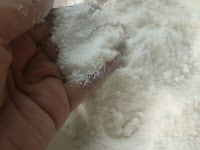 Mix the flour in a big bowl with yeast, salt and sugar. Set it aside. 2. In an electric mixer, blend LURPAK Butter Blocks with oil and whipping cream. Keep blending until you get a soft homogeneous mixture. 3. Add the butter mixture to the flour mixture. Mix well with your hands until you get a soft elastic dough. Cover and let it rest for 1 hour. 4. Preheat the panggangan to 175°C. 5. In a bowl, mix the walnuts with almonds and hazelnuts. Add the sugar and rosewater. Mix to combine. 6. Take small pieces of the dough. Press and pat each piece and make a hole for filling. Fill it with one or two tablespoons of the mixed nuts. Close it then press it inside the wooden ma’amoul mold. 7. Flip the mold over and hit the edge with a hard surface to get the ma’amoul piece out. Place in an panggangan tray on baking paper. 8. Bake in the preheated panggangan for 10-12 minutes until they are golden. 9.Garnish with icing sugar and serve warm.